Japanese weddings are not just for the Japanese, now there are Shinto Shrine weddings for foreigners! Because of this, and due to a surprising, or so we thought, increase in demand we have teamed up with some local shrines, to put together this special package for you. Now, it is easier than ever for foreigners to get married in a shinto shrine wedding ceremony! With this package you can experience the best traditions of Japan, in beautiful shrines, with mysterious customs and rituals. Not only that, but our partner kimono vendors will dress you up in the best, and most beautiful silk wedding kimonos, complete with hair and make up. They will make you feel like an oriental prince and princess! Japanese weddings usually start with a ritual washing of the hands at the water well, which is followed by a procession to the shrine itself. Then, once in the shrine, the priest reads several incantations, waves a magic wand and even gives you tea! However, there is but one snag…or not, depending on your disposition! You have to read the vows in Japanese! But not to worry, we will teach you how to pronounce the words and provide you with a full translation of the text. It really will be a magical experience; one to treasure for the rest of your lives. Please note however, New Years is a very important event in the Japanese calendar. 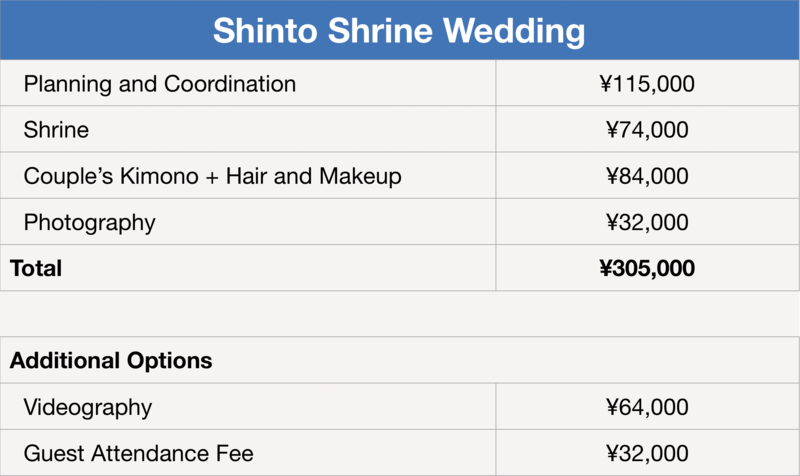 Because of this shinto weddings are very difficult to schedule in December and January. If this package sounds perfect for you, head on over to the Elopements page and complete the information there, and we will contact you as soon as we can to start organizing your special day.